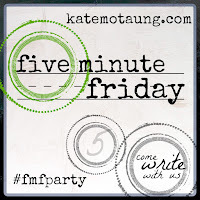 If it weren't for Five-Minute Friday I likely would have forgotten today IS Friday! October means nocturnal harvest hours for my husband and daddy being gone all the time has been hard for our toddler to understand. This is farming and I'm fine with that. Though this week has felt like it's Monday EVERY DAY! No matter how hard I try to keep it up, I feel like our house is always a mess. Maybe one room is clean but then all of the others are messy. If the laundry is caught up, the kitchen must look like the aftermath of a tornado. It's rarely all clean at once! Back in January, my husband was at an out-of-state training for three weeks. With just the toddler and I at home, Baby W still "in utero", my husband gone and brother-in-law back at school, keeping the house up was so much easier. The chores were all done and mess was gone. My husband's work boots weren't tracking dirt, I didn't need to cook full meals and therefore we had much fewer dishes. But the house felt quiet and lonely, especially when my toddler was sleeping. While I'm not an advocate for neglecting the home, those three weeks helped me to see blessings in the mess. Dirty dishes in the sink is evidence of our family meal. We are blessed with food to eat and we have enjoyed the time together! My husband's greasy work clothes mean he is working to provide for our family and he is blessed with a great job. The little baby and toddler outfits mean the Lord has blessed us with two beautiful baby boys! The impossibility of having every room in the house clean means there are numerous rooms in our house! Having a bigger house (compared to our last one) is a wonderful thing I don't want to take for granted. I'm tired and, no, the baby is not sleeping through the night. Yet I feel so blessed to have that baby boy to snuggle with at night. He is an answer to prayer! My devotion time in the morning tends to be distracted because the toddler joins me to "read his Bible" (translated: I read to him) at 6:00 am. I'm thankful for him joining me because I want him to see the importance of spending time with the Lord and reading the Bible. Our home isn't perfect, it's certainly more messy and much more exhausted than it was four years ago. But I love it. Keeping a perfect home isn't my mission as a stay-at-home mom. It's not about the vacuuming or the loads of laundry I do. Staying home with my children is about investing time in our family. 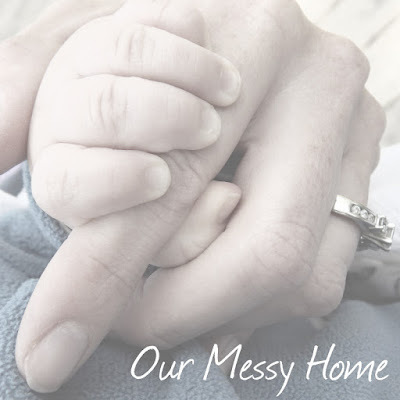 I'm here to teach our children about the Lord, to take care of my families needs and, yes, to make this sometimes... okay, usually... messy house our home. This messy home is full of family, love, memories and, most importantly, Jesus. Visiting from Five Minute Friday. I enjoyed your post and it sounds to me like you have your priorities right. May God continue to bless you and your family. I was just bemoaning about this very thing. I had to stay home from church Wednesday night to clean because there is no time in the day for cleaning. Thank you for providing a positive perspective on something so overwhelming. Giving thanks to the Lord is a great perspective-changer! I struggle with the messy house thing often... reminding myself of the blessings helps to make the chores a little more pleasant. A messy house is a sign of love and an active family- and yes, those are blessings! I can count all the times my house was clean on one hand when my kids were little, they were happy and clean that mattered most! Enjoy it! That makes me think of a sign my brother and sis-in-law have. It goes something like "Please Excuse the Mess. We Live Here." Love it!